Once upon a time, not so long ago I had my doubts about old dogs. I only made the leap because several people much smarter than myself explained the benefits and even then it took a few months into adopting my first dog as a senior that I really understood what they meant. Andrea Portbury of the German Shepherd Rescue and Adoptions of North Carolina recently graced SeniorPooch.com with an interview and there was so much great knowledge in it, that it needed to be split so that everyone could digest as much of it as possible, even if that meant in two sittings. "I think, in a nutshell, everyone is afraid of death, or of losing a loved one. That is completely understandable. But what people don't seem to understand is that youth is no guarantee of a long and happy life. Yes it would be nice to think that you had 10+ years to spend with your dog, but the reality of it is, you just never know. Part of the mission of our senior dog program is to change people's way of thinking of dog ownership. Rather than have people look way, way , way down the path of their imagined life with their dog, we want people to drop their eyes immediately down to the face of the dog beside them. Live in the moment. Take notice of the small things. Don't let an afternoon spent with your dog at a park, or even on the couch watching TV be taken for granted. Sometimes I think that the people who adopt senior dogs *see* their dogs better than the people who get younger dogs. Every day spent together is precious." It's true and I'm lucky enough to have recognized this shortly after adopting my first senior. It's about focusing on what they have to offer and how even small gestures by you, their adoptive parents can help to make you old dog a very content and happy dog. 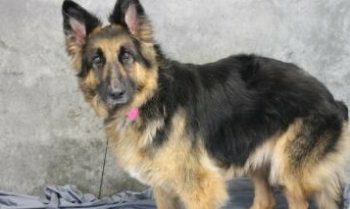 Her group's senior program is one of several that I've seen recently that are trying to change the way that people see their older dogs. She continues with her own personal experience, "I just had the honor of fostering a gorgeous 8 year old GSD. She wasn't even old by our standards (we consider 10 years old to be a real senior!!) but she had all the grace and wisdom and charm of a senior dog. We were together for only a week before I had to let her pass (we discovered after getting her from the shelter that she had advanced lung cancer). I promise you though, for that week, I was completely aware of the time she and I spent together. I would sit with her and rub her tummy and look into her eyes to see if she was in pain, or uncomfortable, or scared. I watched the way she walked - judging by her gait when I needed to give her the arthritis medicine. I can tell you that every time I walked into the room where she was she wagged her tail. I can say with confidence that she preferred chicken over beef and that, given the choice (which she was) she would prefer to have her medicine in liverwurst as opposed to a hotdog. Now granted, this was an extreme situation, and maybe some would argue that an owner would take this much notice of ANY dog that was ill. But it wasn't her illness that made me so cognizant of her. It was the knowledge that we didn't have a lot of time together and I wanted to "absorb" as much of her friendship that I could. Now, looking back on that week, I can honestly say that I remember *moments* with her, not days, not weeks. To me, that is the gift that a senior dog gives you." We live in a crazy mixed up world, but Andrea has figured out that focusing on those moments, all other challenges pale in comparison. I'd like to thank Andrea and GSRA once again for sharing their wisdom. My hope is that someone reads this or any of the posts here on SeniorPooch.com and takes action to focus on the moments by sharing just a small part of their existence with an older canine companion.